There are lots of posts out there about how to use multiple (fake) home directories to force Dropbox to run multiple times on Linux. This approach is great, but it breaks when Dropbox upgrades. If you have had this approach working previously and suddenly it stops working, with only one Dropbox running at a time, it’s likely because the Dropbox client has updated itself in the background. The dropbox client has two components, the one you installed, and then the brains that it downloaded during installation. When an update becomes available, the brains get downloaded again. That’s fine if you only have one Dropbox, but when you have two it makes a mess, because you cannot have two different versions of Dropbox running at the same time. The good news is that you can fix this relatively easily, without re-downloading your files and without re-building your index. So not, in fact, two instances of the same program running in different home directories, but two different programs. Also playing a part here is how you installed dropbox; if you installed in Ubuntu or any of its derivatives using the package manager (the package you have installed is nautilus-dropbox) then you will find .dropbox-dist in /var/lib/dropbox. If you installed it by downloading the deb ifrom the Dropbox website (the package you have installed is dropbox) then it will be under a home directory. Huzzah! All is well, and you can revert to launching your Dropboxes however you were before. 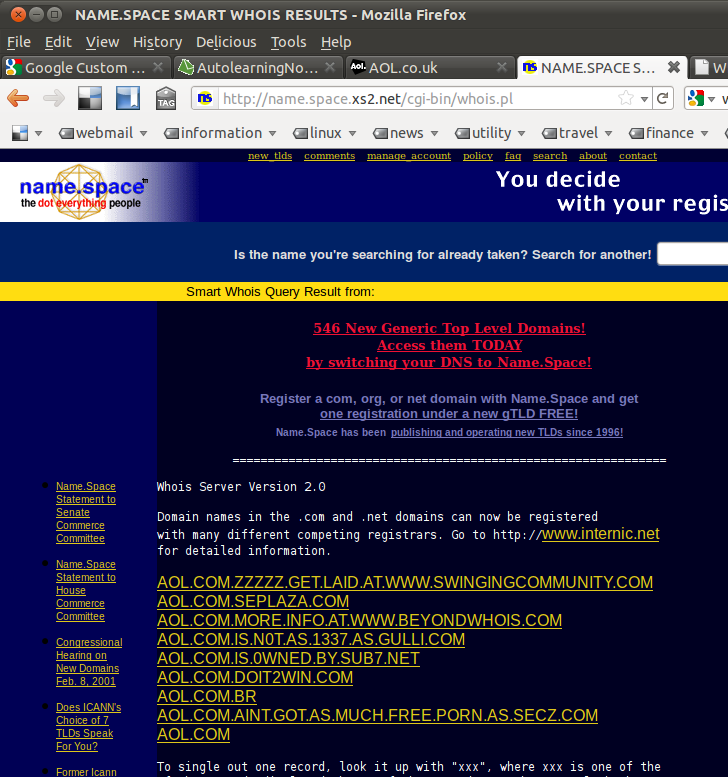 A couple of other WHOIS sites I tried (such as InterNIC) didn’t have this result. I don’t know enough about the structure of the WHOIS DB to know what’s going on, but it looks like something’s been hacked somewhere.